The intimate friendship of Emily Dickinson and Thomas Wentworth Higginson takes wing in two new books. When chronicling the lives of poets, though, it seems inevitable that some measure of poetry creeps in. Dickinson, whose neighbors in Amherst called her “the Myth,” is a perfect example of a subject whose ambiguities encourage a meshing of the genres. 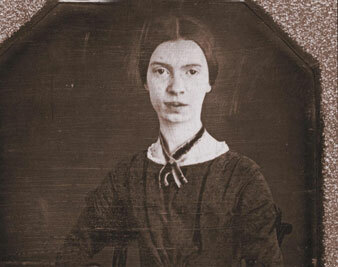 It can work to genius effect, as in Susan Howe’s My Emily Dickinson, a devotional work published in 1985 that probes Dickinson’s allusions to Shakespeare, Emily Brontë, Robert Browning and others. It culminates in a glorious and harrowing vision of Dickinson as Childe Roland “at the moment of sinking down with the sun, like Phaeton in a ball of flame, see[ing] his visionary precursor peers ringed round him waiting.” If Howe’s study succeeded in becoming a kind of poem itself, it did so because Howe’s intentions rhyme with those of Dickinson. Her book is formally and thematically complex, passionate, provocatively inconclusive, coiled and taut. Now there are two new additions to the Dickinson bibliotheca. What kind of poems would they be? Brenda Wineapple’s White Heat looks at the correspondence (in both senses of the word) between Dickinson and Thomas Wentworth Higginson, a minister, essayist and eminent Bostonian, that spanned a quarter of a century. If White Heat were a poem, it would, like Dickinson’s poems, revel in paradox and upend clichés. First and foremost, Wineapple sets out to rescue her subjects from stereotype. She puts further distance between Dickinson and the “Belle of Amherst” label that shadowed her for decades, and she rehabilitates Higginson, who fell into disrepute as Dickinson’s editor when the extent of his revisions, made while readying a selection of her work for book publication in 1890, became a flash point in the twentieth century. The disdain is evident in Adrienne Rich’s famous poem “I Am in Danger–Sir–” but it goes back to the year of Higginson’s death, 1911. That was when George Santayana–teacher of T.S. Eliot and Wallace Stevens–delivered a lecture called “The Genteel Tradition in American Philosophy,” declaring that Higginson’s brand of Transcendentalism “has floated gently in the backwater.” Higginson was the fusty Atlantic Monthly columnist to Dickinson’s ungovernable and unappreciated genius. But in the decade preceding their correspondence, which Dickinson initiated in 1862, Higginson was an abolitionist with a rosy view of what we now call “collateral damage.” In 1854 he declared, against the return of a runaway slave who had been seized in Boston, “A revolution is begun! not a Reform, but a Revolution. If you take part in politics henceforward, let it be only to bring nearer the crisis which will either save or sunder this nation–or perhaps save in sundering.” He participated in a botched plot to liberate the prisoner, taking a battering ram to the doors of the Boston courthouse and clashing with the police inside–one guard was killed in the melee. He was indicted (briefly) for treason. After the passage of the Kansas-Nebraska Act, Higginson helped arm antislavery homesteaders in Kansas and became one of John Brown’s “Secret Six,” planning and financing the violent insurrection at Harpers Ferry in 1859. John Brown “swallows a Missourian whole, and says grace after the meal,” Higginson declared in the pages of the Liberator. “Don’t you know that ‘No’ is the wildest word we consign to Language?” Dickinson speculated. Higginson surely agreed. He said no to his country, as Wineapple shows, in uncompromising terms. Paradox was a hallmark of Dickinson’s verse (“A Death blow is a Life blow to Some/Who till they died, did not alive become–“), and Wineapple, too, uses paradox (beginning with her title) to frame her subjects. Dickinson was “a poseur deeply sincere.” Higginson was “a curious mix of caution and courage.” And their relationship is framed within a larger paradox: are words not actions? The story of the friendship is backlit by scenes from Higginson’s days as an activist and military officer (in the Civil War he led the first federally authorized regiment of freed slaves, the First South Carolina Volunteers). In 1864 he retired to literary life, disillusioned with activism. Yet he was never able to pursue intellectual greatness–what Dickinson called “immortality”–at the expense of social justice. Wineapple sees Higginson and Dickinson as flip sides of a coin: “The fantasy of isolation, the fantasy of intervention: they create recluses and activists, sometimes both, in us all.” By mapping these contradictions so scrupulously, Wineapple allows Dickinson and Higginson their full measure of humanity. It’s true to some degree: Heade painted them, Henry Ward Beecher stuffed them, Dickinson and Higginson referred to them. But there was a whole lot of amateur naturalism going on in those circles; Benfey bears down on the hummingbird imagery because it provides an objective correlative for his real story: a sort of postbellum Summer of Love. There’s Emily Dickinson: “reclining,” as her sister-in-law put it, in the arms of her father’s colleague Judge Otis Lord. There’s the Amherst artiste Mabel Loomis Todd: letting Martin Heade paint the panels of her plunging collar with sweet peas; befriending the besotted teenager Ned Dickinson; dropping him for his father, Austin. Despite Wineapple’s sympathetic grasp of Higginson’s life and works, his contradictions aren’t nearly as electric. Yes, he too had a vigorous and complicated sexuality. The renowned essayist had thrived on the routines of military life: he championed virility and admired the male body. Women found him attractive, and he made himself their chivalrous knight as a suffragist. Also chivalrously, he remained devoted to his invalid first wife until she died. Then, rather than fall for one of the intellectual women he admired, he hastily married a young, pretty society girl. (It’s less of a contradiction when we read that his first wife, Mary Elizabeth Channing, was something of a thwarted intellectual herself. She was prickly and anti-child. Higginson desperately wanted children; his second wife obliged.) Wineapple’s accounts of Higginson’s involvement in the Secret Six and of his military exploits are riveting. They serve to underscore her point that he was a sort of inverse Dickinson: fiery radical in the realm of action. Late in life he ruefully admitted that he had internalized Emerson’s dictum “Better that the book should not be quite so good, and the bookmaker abler and better, and not himself often a ludicrous contrast to all that he has written.” But Emerson was wrong. Higginson’s scruples, and Dickinson’s lack of them, confirm the old Faulkner saw about “Ode on a Grecian Urn” being “worth any number of old ladies.” Collateral damage indeed. There is no conceivable beauty of blossom so beautiful as words,–none so graceful, none so perfumed. It is possible to dream of combinations of syllables so delicious that all the dawning and decay of summer cannot rival their perfection, nor winter’s stainless white and azure match their purity and their charm. Love is its own rescue, for we–at our supremest, are but it’s trembling Emblems. Even at the death of her 8-year-old nephew, Gib, in 1882–a blow from which she never recovered–she could write to her sister-in-law, in crescendoing phrases: “His Life was like the Bugle, which winds itself always, his Elegy an echo–his Requiem ecstasy.” Her metaphors were dictated by the ear; her cerebrum seemed to have grown right out of her cochlear nerve. Dickinson’s more famous contemporary Helen Hunt Jackson once chided her: “You are a great poet–and it is a wrong to deny to the day you live in, that you will not sing aloud. When you are what men call dead, you will be sorry you were so stingy.” When Dickinson died in 1886, her nearly 2,000 poems bore witness to a soul that was anything but stingy. But their discovery prompted feuds among her survivors–Lavinia, her sister; Sue Dickinson, her socially prominent sister-in-law; and Mabel Loomis Todd, her brother Austin’s mistress and a writer and painter in her own right. Lavinia and Mabel teamed up against Sue, enlisting Higginson’s editorial help in assembling a collection of poems; later, Lavinia would vengefully sue Mabel on a separate property issue and demand that Higginson leave Todd’s name off the book (he refused, but on the property matter, Oliver Wendell Holmes ruled in Lavinia’s favor). Higginson was just a bystander to these machinations, but blame fell heavily on him when scholars uncovered the extent to which grammar had been corrected, punctuation and titles added, dashes disappeared. Yet the first edition of Poems sold out–as did the second and the third and the fourth–suggesting that the nineteenth century was ready for Dickinson in some form. Wineapple writes, “Fed for years on Tennyson, Patmore, and Longfellow or, more recently, on the folksy verse of James Whitcomb Riley and the jingles of Rudyard Kipling, to say nothing of the verse of Thomas Bailey Aldrich, they were evidently tired of the didacticism and overrefinement of poetry without heat.” They were weary, in other words, of hummingbirds. Higginson lived out his later years in physical, if not mental, comfort. He championed women’s writing. He translated Epictetus, the freed slave turned Stoic philosopher. The influence of Transcendentalism, in which his soul was minted, had faded from American life, and in the waning days of the nineteenth century he deplored the excesses of the Gilded Age, scoffing: “Everything which does not tend to money is thought to be wasted.” He felt that Dickinson was posthumously keeping the flame of spirit alive with her “irresistible needle-touch” (as he wrote, in 1890, in this magazine). She still is. Are words not actions? “Of our greatest acts we are ignorant–You were not aware that you saved my Life.” When Dickinson wrote this to Higginson in 1868, she must have known that the events they set in motion together would, for others, do the same.